Penujak village, in West Praya district, Central Lombok, is less than an hour by car from Mataram. The village is on the main road between Praya, the capital of Central Lombok and Kuta, a tourist resort on the South coast. 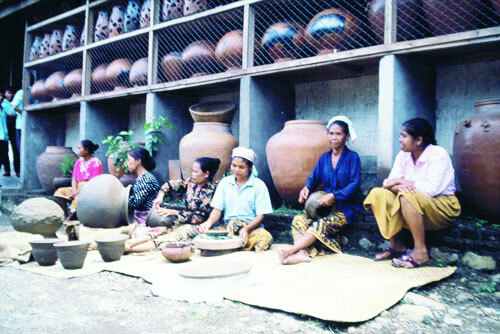 In Penujak, the potters are using simple kilns to fire their pottery, which often has carved designs or applied decoration such as Lizards and frogs. The thickness of pots from this area is usually more than others, thus why the pots looks stronger and heavier. Generally during the preparing of clay, in Penujak the clay is not soaked in the water to get flour of clay (very fine clay) as other villages, but pounded before mixed it with sand and water.